Tomio Koyama Gallery Singapore is pleased to present a group exhibition featuring Southeast Asian artists Khvay Samnang (Cambodia), Mohamad ‘Ucup’ Yusuf (Indonesia), Arin Rungjang (Thailand), and Shooshie Sulaiman (Malaysia). SEA (Social Engagement Artist / Southeast Asia) is a group exhibition involving prominent artists in the region whose work explore culture, history and social engagement, set within the context of Southeast Asia. The exhibition will feature digital C-prints by Khvay Samnang, woodblock prints and paintings by Mohamad ‘Ucup’ Yusuf, mix-media paintings by Shooshie Sulaiman and a drawing and a sculpture by Arin Rungjang. Khvay Samnang’s work engages with concepts of mediation, change and continuity. He offers new interpretations of history, longstanding cultural practices, and contentious current affairs. Khvay observes the urban environment and its growing capitalism in the Cambodian society and beyond, highlighting them through his art. Similarly, Mohamad ‘Ucup’ Yusuf narrates and comments on the realities of Indonesia through his work. He believes that art is a form of expression, documentation and hence education, through which a better future may be conceived. His unique woodblock prints often illustrate social issues such as corruption, environmental damage, consumerism and social division, while his paintings depict simpler yet rich and symbolic motifs with explorations in colors and textures. For Shooshie Sulaiman, artistic practice and life are inextricable. Many of her works are based on situation, experience, and process, unique to her identity. Seeking knowledge to educate herself and layering semiotics, contradiction and beauty, her work explores history, cultural and social configurations and human experience and imagination within the context of Malaysia and Southeast Asia. Arin Runjang’s interests lie in the imaginary and symbolic meanings found in everyday spaces, objects and exchanges. His projects trigger the dissolution of conventional barriers such as that between public and private, in the process drawing together disparate histories and contexts. Arin’s work makes manifest a constructed reality that usually remains hidden from us. The artists Mohamad ‘Ucup’ Yusuf, Arin Rungjang, and Shooshie Sulaiman will also participate in a roundtable discussion at Art Stage Singapore’s ARTnews talks series on Saturday, 24 January 2015, 11:30am – 12:30pm at Marina Bay Sands Expo and Convention Centre, Level 4, Room 4111. Join Mohamad ‘Ucup’ Yusuf in a printmaking workshop set in the gallery and experience the joy of communicating through art making. The workshop will focus mainly on woodblock printing, the choice of medium of Taring Padi, an artist-activist collective from Yogyakarta which Yusuf is founding member of. Woodblock printing is characteristic of its modest reproduction and distribution, making it an appropriate mode of sharing with the community. Simple carving techniques will also be covered during the workshop. Materials will be provided. Khvay Samnang (b. 1982, Svay Rieng) is an artist based in Phnom Penh, Cambodia. Khvay holds a BA in Painting (Royal University of Fine Arts, Phnom Penh, 2006). He is a founding member of the artist collective Stiev Selapak and the spaces Sa Sa Art Projects and SA SA BASSAC. Selected 2013 exhibitions include If the World Changed, 4th Singapore Biennale, Singapore; Everyday Life, 4th Asian Art Biennial, Taiwan; Sights and Sounds: Global Film and Video, Jewish Museum, New York; Phnom Penh: Rescue Archaeology, ifa, Berlin and Stuttgart; Out of Nowhere: Photography in Cambodia, creativetimereports.org; Developments, Seventh Gallery, Melbourne. Selected 2012 exhibitions include ROUNDTABLE, Tobias Rehberger Pavilion ‘You Owe Me. I Don’t Owe You Nothin.’ Gwangju Biennale; Terra Incognita: Noorderlicht Photography Festival, The Netherlands; Current Views and Actions: Ruptures and Revival, ICAS, Singapore; Photography and Performance Documentation from Phnom Penh, Northern Illinois University Museum, USA; Deep SEA, Primo Marella Gallery, Milan, Italy; Mondi, Dryphoto Arte Contemporanea, Prato, Italy. The artist participated in the Creator in Residence program Tokyo Wonder Site, Tokyo in 2011. Mohamad ‘Ucup’ Yusuf (b. 1975, Lumajang, Indonesia) is an artist based in Yogyakarta, Indonesia. Yusuf graduated from the Indonesian Institute of Art (ISI) in 1995. In 2012, he was finalist for the Graphic Trienalle V, Indonesia, and Bandung Contemporary Art Award. His accolades include Mural Hikayat Indonesia at Museum Palace Yogyakarta, Indonesia (2009), and Best Painting in the “Reflections of an Era” exhibition, Fine Art Department ISI, Yogyakarta, Indonesia, Museum Vredeburg Fort Museum, Yogyakarta, Indonesia (1998). Yusuf has exhibited internationally in Asia, Australia, Europe, and USA, with three solo exhibitions in Indonesia and Singapore. In 2013, he exhibited in “Welcome To The Jungle” at Yokohama Museum of Art, Japan, and Contemporary Art Museum Kumamoto, Japan. 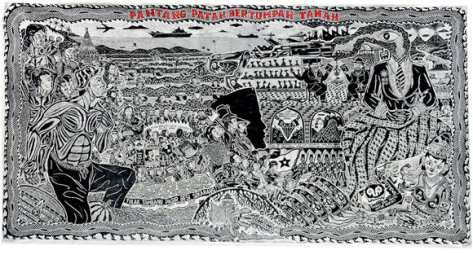 He is a founding member of the Indonesia artist-activist collective Taring Padi since 1998. Yusuf is in the permanent collection of the Fukuoka Asian Art Museum, Palace Museum Yogyakarta, Queensland Art Gallery of Australia, and Singapore Art Museum, as well as private collections around the world. She has presented in many important international exhibitions including Documenta 12 (2007), Asia-Pacific Triennial (2009- 10), Singapore Biennale (2011), and Gwangju Biennale (2014). Following the Art Unlimited section at Art Basel in 2014, she has presented a large scale installation at the Encounter section at Art Basel Honk Kong curated by Alexie Glass-Kantor in 2015. The recent solo exhibitions include “Malay Mawar” at Kadist Art Foundation, Paris in 2016 and “Shooshie Sulaiman Drawings” at 8/ ART GALLERY/ Tomio Koyama Gallery, Tokyo in 2018. Her work is collected by Kadist Foundation, Paris, Singapore Art Museum and the National Museum of Modern Art, Tokyo.